Kevin Smith Transportation Group is a Luxury Transportation company that services the entire Greater Philadelphia, PA area. KSTG delivers services daily in Bucks, Chester, Delaware, Doylestown and Philadelphia counties. This includes more than 300 cities, towns, boroughs and Providences across the area. One of the places a KSTG vehicle will regularly service is Tredyffrin Township, PA.
Kevin Smith Transportation Group delivers both Leisure and Corporate Transportation services in Tredyffrin Township, PA. KSTG’s Leisure division will often be seen sending out a Wedding Limo or Wedding Shuttle on most weekends. Service requests for a Limo or Party Bus for a Night on the Town or a trip to Philadelphia, PA for a concert or show is very common and popular for those who live in Tredyffrin Township, PA. The exciting requests for a Party Bus to the Manhattan Cruise Terminal or a night out at the casinos makes for a great night. If you are fortunate enough to work for one of the amazing companies in Tredyffrin Township, PA, then you may require the services of Kevin Smith Transportation Group and our Corporate Transportation division. Airport Transportation is a common service request with Philadelphia International Airport (PHL) located so close to Tredyffrin Township, PA. However, with nearly a dozen International Airports in the Mid-Atlantic area, many companies will utilize KSTG’s services for Airport Transportation to Newark International (EWR), Kennedy Airport (JFK) or other points north or south of the Philadelphia, PA area. Other Corporate Transportation services that Kevin Smith Transportation Group offers companies in Tredyffrin Township, PA include Shuttle Services. This may be needed for moving employees to local SEPTA stations for both their morning commute and returning home in the evening. KSTH Sprinters and Mini Buses are popular vehicles for this service. Some companies, with offices or clients around the country, often have employees traveling through local FBO’s. When Private Aviation is utilized, KSTG Cadillac XTS’s and Black Yukon’s are often seen transferring employees from their offices in Tredyffrin Township, PA to those local FBO’s including Northeast Philadelphia Airport, Doylestown Airport and Wings Field. Many companies in Tredyffrin Township, PA have been pushed by their Senior Management or Counsel’s office to follow strict Duty of Care requirements with their employees. This means that the days of using an unregulated Black Car Service for Corporate Transportation services is no longer allowed. For Kevin Smith Transportation Group, this means that our Black Car Service division, including our fleet of Cadillac XTS’s, Black Yukons and Black Infiniti’s, are regular visitors to Tredyffrin Township, PA.
Tredyffrin Township, PA is a township located in eastern Chester County, PA. The population is estimated at 29,332. Originally settled in the late 17th century, Tredyffrin is bounded by Delaware and Montgomery counties. It includes on its northern boundary a small part of Valley Forge National Historical Park, where George Washington encamped during the American War of Independence. Tredyffrin and the entire Great Valley region also have many limestone deposits. Unincorporated communities within Tredyffrin Township include Chesterbrook, Strafford, a portion of Paoli, and a portion of Wayne, Howellville (the intersection of Swedesford and Howellville Roads) and East Howellville (along Howellville Road, west of the intersection of Howellville Road and the border between Tredyffrin and Easttown Townships). Tredyffrin is bordered by Easttown, East Whiteland, Willistown, Charlestown, Upper Merion, Radnor and Schuylkill townships. On 13 March 1684, William Penn decided to set aside a portion of Pennsylvania for the Welsh to settle in. This area, known as the “Welsh Tract“, was surveyed in 1684 and included several modern-day townships, including Tredyffrin. Although the Welsh Tract was originally meant to be a self-ruling municipality, it was divided between Chester County and Philadelphia when that county was created in 1685, and the Welsh subsequently submitted to the authority of Chester County. In 1707, Tredyffrin was incorporated as a township. 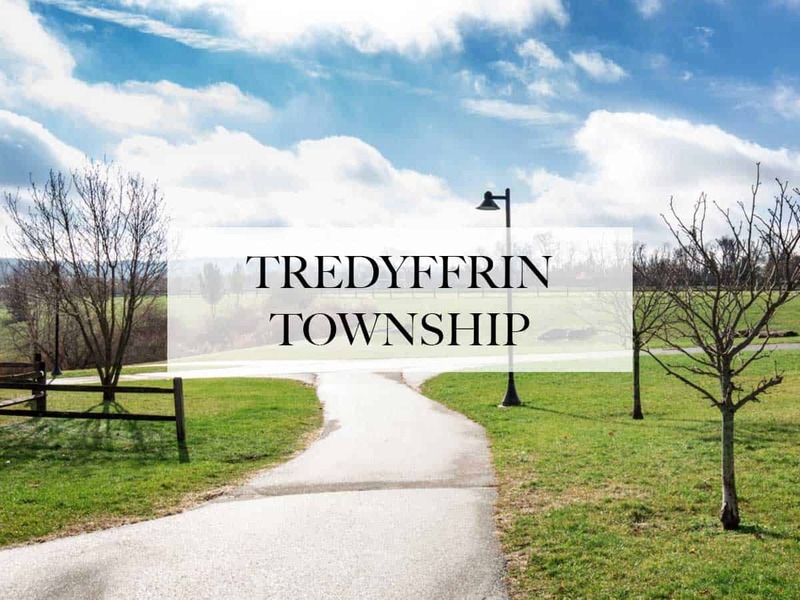 Tredyffrin was quick to develop into a thriving township. In 1710, the first mill in Tredyffrin was started by Thomas Jerman on what is now North Valley Road. Swedesford Road, one of the first roads in the township, was created by 1718. As the population of the township grew, with 30 resident landowners in 1722 and 83 in 1774, churches sprung up to meet the demand by religious residents. In 1710, the Baptist minister Hugh Davis moved to the Great Valley from Britain and, there being several Baptist families in this area, the Great Valley Baptist Church was formed on 22 April 1711. The church originally met in Radnor. However, there were enough members of this Baptist church that by 1722, a log building was erected in Tredyffrin to serve the congregation. In 1714, the Great Valley Presbyterian Church was started in Tredyffrin. It was the first Presbyterian church in Chester County. A church building was built in 1720 and was used for 73 years. Also in 1714, the Quaker Haverford Monthly Meeting (which was established in April 1684) voted to allow its members that lived in the Great Valley to hold a meeting every other month in Tredyffrin, which was called the Valley Meeting. There was also an Anglican church, built in 1700. As Tredyffrin includes part of Valley Forge National Historical Park, there are many Revolutionary War-related sites in the township, especially the park and houses where various generals were quartered. The entire team at Kevin Smith Transportation Group is proud of our partnership with every company, venue and person from Tredyffrin Township, PA who chooses KSTG as their #1 Transportation Company. We believe our priorities around luxury helps us deliver our services for everything from a once in a lifetime Wedding celebration to supporting our Corporate clients who require use of our Shuttles and Sprinters for a company event. With Tredyffrin Township, PA and KSTG working together, we are confident KSTG vehicles will continue to support the entire area for years to come.